This is the continuation of this first post on change management and snake oil. There was a largely positive response to the first piece – with the exception of one commenter who said my negativity about HR nearly made them stop reading. I think that negativity is necessary to provide the provocation to the listener to reflect on how much they just take for granted now and hopefully to challenge more in the future. I accept people may not like the approach, I also accept I may be wrong, but it’s the one I’ve chosen. It gets people’s attention. I appreciate the feedback all the same – and invite more thoughts and suggestions on materials for the below. So… I’ve promised you science and I’m going to deliver a few oversights on research that support the position that attempting to change people is counterproductive. Before I do that there is philosophy to throw into the mix- and whilst I can’t use that to prove anything I can use it to help provide some more questions. Jean Paul Sartre described the concept of ‘Bad Faith’. That people cannot confront the infinity of choices that are actually open to them and consequently retreat into playing characters. The waiter in the restaurant adopts the behaviour of a waiter so as to give himself definition. He turns up on time, he speaks to his manager and customers as you would expect a waiter to, he adopts the mannerisms of a waiter. You see it with salespeople every day. They all look the same. When I was writing this speech I invited other people to contribute, one person Ali Germain, a UK pro, suggested that whilst in the Superman films he enters a revolving door as Clark Kent and pops out of the other side as Superman – in our working lives we do the opposite. We become weaker when we enter the workplace. We let our senses and passions become dulled and switch off the richness of our brains. It’s safer than risking it all each day and being disappointed. I would like you to reflect on whether we might just have change management initiatives in organisations simply so organisations do not have to face up to the enormity of external change. It isn’t to enable change at all, it is simply a front to create a comfort blanket of control and stability. And yet understanding change isn’t understanding control – change is the knowing that everything is in flux. We are people with choices – we aren’t the business cards that you carry saying Head of Corporate Property, Group Property Director or Workplace Strategist..You could wake up tomorrow and not go into work. Or you could go into work and behave completely differently, be the person you are outside of work. Be Superman. How much do people like to feel part of a group? Well, we’ve known this for a while. It actually trumps so of our desire to speak the truth. 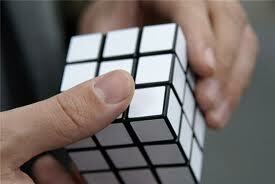 How much do we like to feel we are making independent decisions and solving problems on our own? Dan Ariely and the team at the Centre for Advanced Hindsight at Duke University created an experiment where individuals were asked to create solutions to a world problem using words that were mainly synonyms. They could only come up with one solution to the problem. Despite the fact that the ideas were, intrinsically, all the same idea – when individuals were brought together to discuss the their ideas people fought passionately that their wording and therefore their ideas were the best. We want to believe our thoughts are unique, even when they are demonstrably the same as other people’s we still fight to believe they aren’t. How much do people like to feel their work is valued? The Ikea effect is another Dan Ariely experiment, described in his book ‘Predictably Irrational’. It’s based on the observation that people are more attached to things that they have created themselves – and overrate how well others will rate that object. The wonky IKEA wardrobe that you took you all weekend to build and almost cost you your marriage – that is a source of pride for you. Everybody else sees a wonky wardrobe . The researchers found that the more complex the building was the harder it was to dissuade people that the finished result wasn’t brilliant. Think for the moment about the organisational parallels. It is almost like a company wide change project run by the CEO is destined to have the CEO sitting in the middle of it, marvelling at the complexity of what he has created and bewildered why other people don’t see its greatness. Marvel at this wonky wardrobe of a company I have created. As soon as things become hard and complex for us then we believe there must be value there. Which is why asking me (or any professional charged with helping organisations change) will never get a rational answer. We need to believe it to be true. So we’ve established some of the key factors that we have at play. Next let’s talk about how we can play with some of these things to get people to act differently – and whether it is right to play with people’s choices. 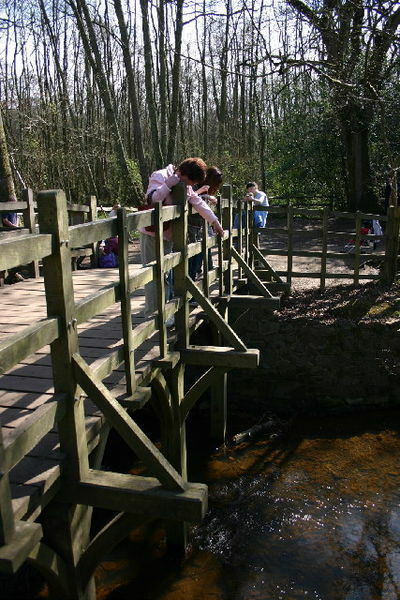 And then it is over to you to go and face your own choices – Do we free people up and and try and control change. Or do we try and ride the wave of change? Which feels more comfortable and which feels more sensible. Knowing that people will lie in groups, have a need to feel they have contributed that overrides logic and overvalue their own work – and that this probably won’t change – how do I help progress happen for my organisation. A few weeks ago my mother (of all people) let me know about a game. I got a fortune cookie. 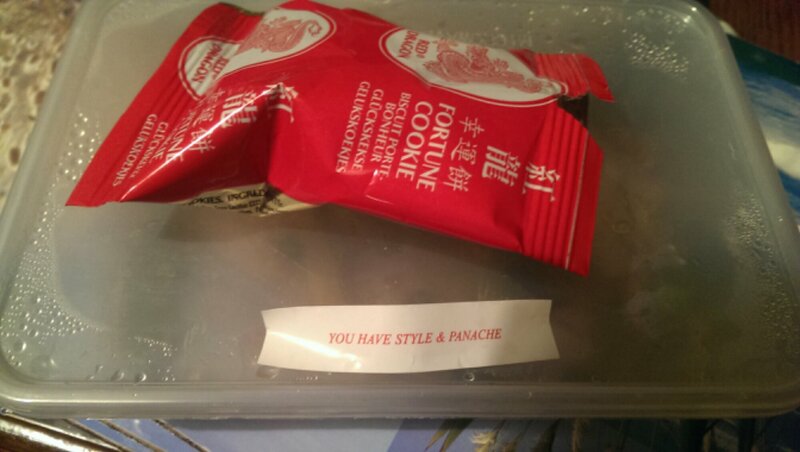 It read ‘You have style and panache’. Anyway, a few days later it was picked up on Twitter and Kate Griffiths-Lambeth added some fortunes of her own from her Chinese meal..
To play all you do is scan down someone’s timeline, pick a tweet that would benefit from the words ‘in bed’ being placed at the end and then quote/retweet it adding the words. If someone hits the RT or favourite button then move down their timeline and strike again..
"@dds180: @KateGL not sure how many people we've entertained with this so far vs how many are exasperated" in bed. “@KateGL: @nicky_t @malcolmlouth @dds180 @timscotthr @nicky_t What would I do without you lot?…my life would be much less fun in bed"
Loved this piece by @SimonHeath1. Brief and brilliant.